My wife and I have been photographing various locations in Door County for a number of years now. The peninsula is a beautiful and intriguing place filled with incredible natural features. Eventually these places start to seem a little less magical with each passing visit simply because its no longer a “new” experience. Enter the kayak. By taking to the water, our relationship with many of these locations has been revitalized by enjoying them from an entirely different perspective. 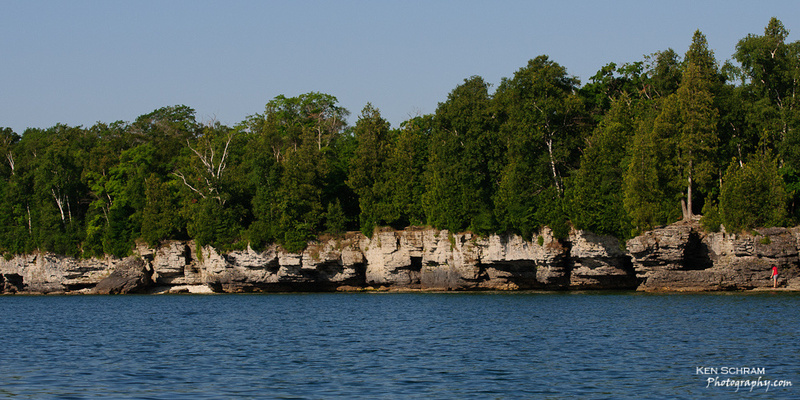 For example, Cave Point near Jacksonport, WI is an incredible natural wonder. Sandstone cliffs have been worn away by the crashing waves of Lake Michigan for eons to create some spectacular caves and water features. It’s one thing to view them from the nice county park, but an entirely different experience to view them from the water. Don’t own a kayak? No need. There are a number of tour agencies in The Door more than happy to set you up, teach you how to paddle and then take you on this magical tour. 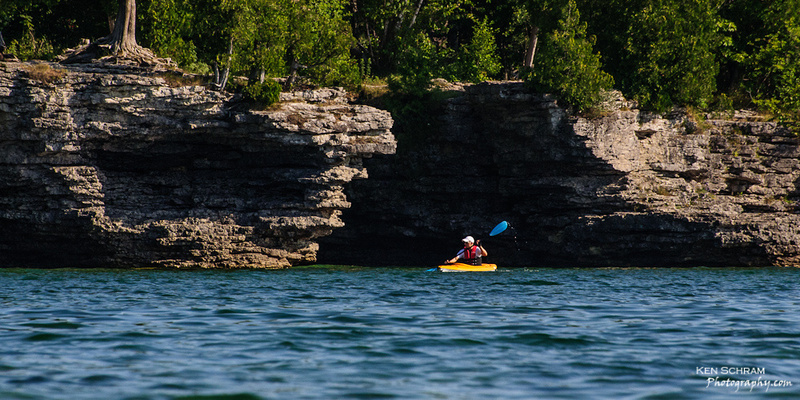 If you do own a kayak and are interested in exploring Cave Point, here are a couple of things to consider. 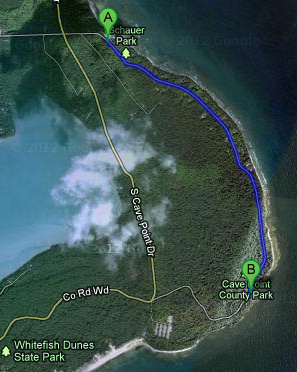 Launch from 5648 Schauer Road just north of Cave Point. Like most landings on the peninsula it too suffers from low water levels. Be prepared to walk your craft out a ways before you’re deep enough to float. Take notice of the wind. The launch site is somewhat protected and the conditions as you round the point can get pretty nasty. Respect the caves. If you’re visiting during calm conditions its possible to get up close and personal, but just like all other nature adventures, leave things as you find them. If you picked a windy day, my advice would be to keep your distance lest you get between the rocks and the waves and pummeled into fish food. Chose the time of day wisely. I’d recommend early morning as it’s the best chance for calm conditions and you can beat the rush of the many kaya tours. Keep an eye out for the Door County Rock Stackers. They’ve been here too! Until next time, keep click’n.